Assistant Fire Chief Brian Schaeffer at Station 9. Outside the window of Spokane Fire Chief Bobby Williams’ office, downtown Spokane cuts a jagged skyline into the day. As Williams explains the ins and outs of trying to keep the same levels of service with less, three of his trucks are out right now, dealing with medical emergencies. This is one new reality of firefighting: more medical calls than ever. There’s another new reality about to take place: Mayor David Condon’s budget, which comes amid his large reorganization of city government and an effort to close a multi-million dollar budget shortfall. Condon is working toward eliminating nearly 100 city positions, most of which are currently unfilled. Bolstered by a conservative City Council majority, even City Council President Ben Stuckart concedes it is likely to pass with few changes when it’s voted on Dec. 10. Under the mayor’s budget, the fire department will lose 23 positions, about half of which are currently vacant. That leaves the fire department with a little more than 300 workers. 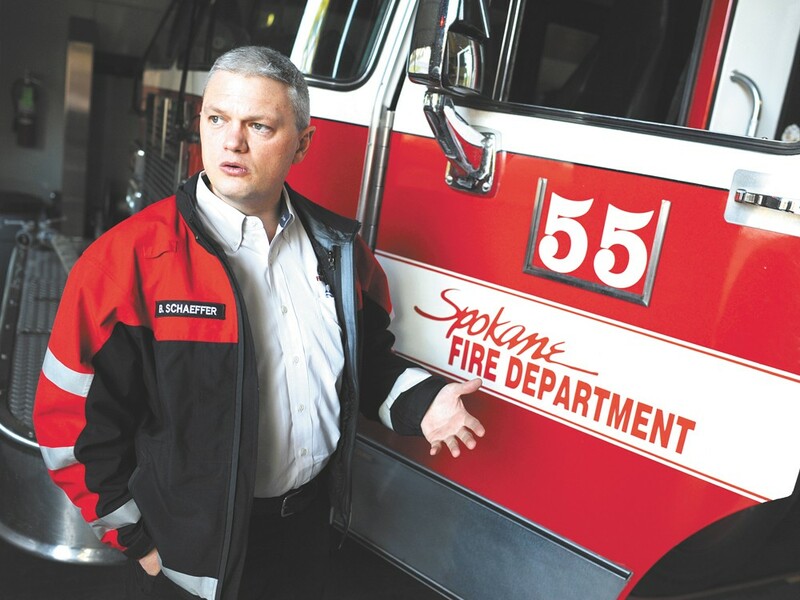 Those options were to close one of Spokane’s 15 fire stations, to take a fire engine out of service or to shift trucks around and partially close Fire Station 9 on the South Hill at 1722 S. Bernard St. Williams chose the third. What that means is a two-person rescue unit will move into the South Hill station. It can deal with medical calls but won’t be able to fight fires on its own. When a fire breaks out in its territory, it will have to wait for backup from one of the city’s other 14 stations. Williams says other stations can often respond just as quickly to a fire. But if those firefighters are dealing with their own calls or are battling a blaze elsewhere in the city, there might not be immediate backup. When Condon announced his budget in August, he insisted the 19 eliminated police officer positions wouldn’t hurt the city’s police force because those spots were already vacant. But because it takes so long to train officers, officers who retire or decide to otherwise leave create holes that can’t be quickly replaced. And that’s how new Spokane Police Chief Frank Straub must deal with a situation similar to Williams: doing the same with less. Straub says he’s trying to get an early sense of how many officers will retire in 2013. The new chief is also assessing whether he can free up manpower for the streets by hiring civilians to do administrative work currently handled by officers. Stuckart sits in Atticus one day last week, his back to the counter, pouring San Pellegrino from a can. He spews exasperation about how the four conservative council members voted down a usually routine property tax levy — it would cost about $4.50 per year for most homeowners — that Stuckart hoped could be dedicated to police and fire staff. He believes the conservative bloc is trying to punish the police and firefighter unions. “They’re already cut to the bone, we’re already behind other cities,” Stuckart says, referring to police and firefighters. If he had the votes, Stuckart says he’d propose to take $2 million in reserve funds and split it between police and fire to help with staffing next year. In reality, he’s planning to offer some more modest proposals, but he won’t elaborate, saying that if the details were printed the conservative council members would just find excuses in advance to oppose them. Better, he added, to put them on the spot. Regardless, Stuckart doesn’t have much faith.